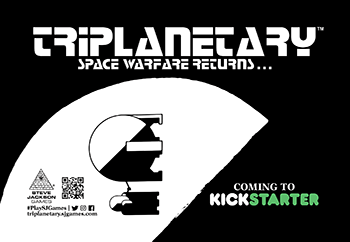 Daily Illuminator: Triplanetary Kickstarter Delayed to January 2018! December 2, 2017: Triplanetary Kickstarter Delayed to January 2018! 5, 4, 3, 2, 1 . . . Abort launch! Abort launch! Well, that is embarassing. Fans who visited our booth at PAX Unplugged or checked out our unboxing on #SJGamesLive were waiting with bated breath for the Triplanetary Kickstarter. Well, November 20 came and went, with no campaign start. While we were happy with the state of the campaign, we wanted to add a little more. This won't be a huge campaign, with tons of bells and whistles, but we did want to make sure we gave something special to fans of the classic game, as well as new arrivals looking to explore the solar system. Plus, we've waited 27 years to make Triplanetary a reality; we can wait a tad longer to make it perfect. The new launch date is set for January 15, 2018. Keep that Christmas money from grandma safe. It's going to come in handy! And make sure to follow us on Kickstarter to get an alert when we launch the project!